An informal evening based around security, and how to bypass it... Whether you've always been fascinated with picking from spy movies but never knew where to start, or if you're a seasoned picker who's been longing for a place to chat about spool pins and shear line tolerances, this evening is for you! 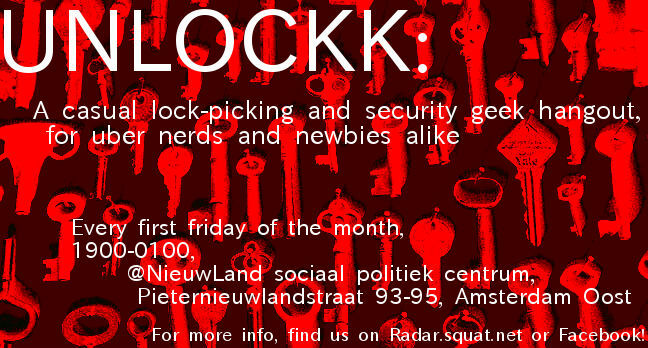 Conceived of as a relaxed, social way for people to learn, practice, and share skills related to lockpicking, and other ways of playing with security- in a way, "hacking", in it's broadest sense. (We also welcome non-security based activities; this can be a space for all forms of geekiness, from rubiks cubes, to crafting jewelery from broken electronics! we like the definition of " a hack as a project undertaken or a product built to fulfill some constructive goal, but also with some wild pleasure taken in mere involvement.") Locks, picks and other materials will be provided, but if you have them, please bring them along, as well as anything else you would like to play with/ show people!